John McGuinness in action on the Honda Racing Fireblade SP2 during practice at the North West 200 in May. Six-time North West 200 winner John McGuinness has confirmed he intends to return to the international road race next year. The Morecambe man suffered a serious leg injury after crashing during practice at the event in May, ruling him out for the rest of the season. The scene of John McGuinness's crash at Primrose Corner, which ruled the Morecambe man out for the rest of the 2017 season. McGuinness felt his crash at Primrose Corner was caused when his new Honda Fireblade SP2 failed to slow when he rolled off the throttle. His team-mate, Guy Martin, also experienced issues with the machine during a disastrous year for the Honda Racing team. Martin made his comeback amidst a blaze of publicity in 2017 but failed to live up to the hype. In an unprecedented move, Honda withdrew from the North West 200 due to uncertainty over the cause of McGuinness’s crash. More drama followed at the Isle of Man TT, when Martin crashed at high-speed on the opening lap of the Superbike race at Doran’s Bend, fortunately escaping injury. Honda later pulled out of the blue riband Senior TT at the end of race week. McGuinness’s future with Honda is unclear after a long and fruitful association with the manufacturer, but the 46-year-old says it is possible he will race at the North West in the smaller capacity classes if he does not have the strength to ride a Superbike. 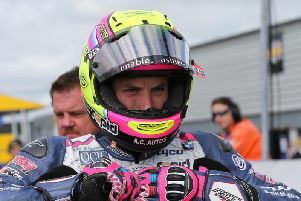 The 23-time TT winner, who also suffered back and rib injuries in the crash, said: “It is possible that I will race at the North West again in the smaller classes, on a 600 or a Supertwin maybe. “The big bikes might just be out of my reach after the injury but we will see what happens. “It has been tough but bike racers are made of different gravy. I’ve done the North West for 24 years and only crashed once before when I slipped off at Juniper chicane in 2004. McGuinness paid tribute to road racing fans for their support over the past five months. “The fans I’ve met all want me to come back. I’ve been racing for a long time and I have missed it,” he said. North West 200 Event Director Mervyn Whyte said there would always be a place at the event for McGuinness, regardless of whether or not he was competing. “We wish John a speedy recovery and he will always be very welcome at the North West 200 whether he is racing or not,” said Whyte.